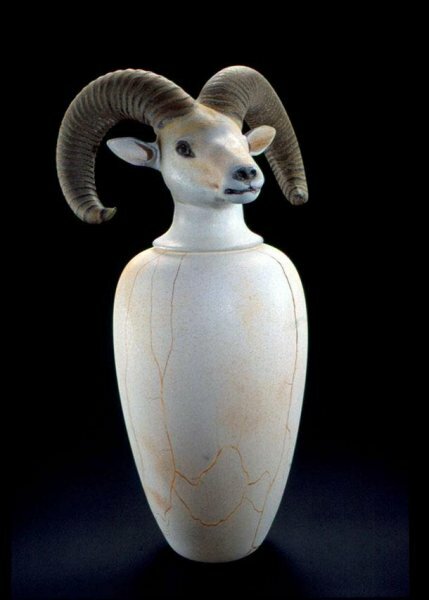 Canopic Jar: Dahl Sheep, 1994 by William Morris, 36" x 20" x 15"
Greetings! I have just agreed to help sell this beautiful Canopic Jar by William Morris. This is such a magnificent piece that I felt it warranted a special edition of Holsten Galleries News. As many of you know, the Canopic Jar series is the most sought after of any series by William Morris and perhaps by any contemporary glass artist. Morris created this series back in the 1990’s and now they rarely tend to come onto the secondary market. Please feel free to contact me for further information about the piece.